Needless to say that engagement is a tremendous moment in our life. Going out may take really a lot of time, years. But when your relationships become serious, it is an unbelievable moment. The emotions are overwhelming and it would be great to imprint them. Actually, you can invite engagement photographers so that they could take engagement pictures for you and your girlfriend in Toronto. So, if you are a man, you live in Toronto and intend to make a proposal to your lady, we can assume the following variant for you. Believe us, after many years you will want to remember such an important event in your life. The engagement album will help to restore the engagement day in details. Smiles, tears, touches – everything will be stored in your engagement album. All our customers admire the albums we offer. This is not just a book; this is a thing that can become a family heirloom. What is more, you will be proud to show it to your friends! Engagement shoot up to 2 hrs, 200 photos, online storage – 500$, Album 250$, Video 500$. Why each couple should order engagement photography? Firstly, remember that only you and engagement photographer know about your intentions. It means that the emotions of your girlfriend will definitely be unpredictable. She might cry, burst out of laughing, scream because of happiness, kiss you or even keep silence. She might just be shocked. In this case the main task of an engagement photographer will be to predict possible lady’s emotions and choose the best aspect to take photos. Secondly, place. Toronto engagement photographer must learn the place of future proposal aforehand. Undoubtedly, our engagement photographers are rather advanced and have great practice how to take photos at different locations in Toronto. They take everything into account: weather conditions, lightning, etc. Thirdly, clothes are efficient as well. It is necessary to think about clothes you are going to wear. Usually, engagement photographers in Toronto recommend choosing bright colours. As a result, you will receive colourful and saturated pictures. How to convince your lady to wear a bright dress and high-heeled shoes for a date is, in fact, your task…)) but the result is worth your efforts. On the other hand, what is the difference what clothes you are wearing when you are the happiest couple in the world at this moment? And your emotions are natural. both of you. Our engagement photographer in Toronto will tell you what make-up to choose considering weather conditions and lightning. Finally, choose the right flowers for your sweetheart. For instance, if you are going to wear black and white classic clothes, red gerberas are a great variant. If your girlfriend loves roses, prepare a huge bouquet of pink, purple or red roses. Apparently, red is the colour of love but if your lady likes white or yellow, make her happy. Our engagement photographers in Toronto are experienced enough and can work with any colour you choose. And you should consider one more peculiarity of engagement photography. There can be unpredictable moments and unexpected emotions for both of you. Such photography conditions need experienced photographers who can catch this unbelievable moment. If you still think, don’t think. Our engagement photographers in Toronto have enough work experience to do the job perfectly. Just trust us your best moments and we will make marvelous engagement pictures for you and your sweetheart. Be sure you will be satisfied with the result and will be proud to show your engagement photos to your family, friends and future generations. 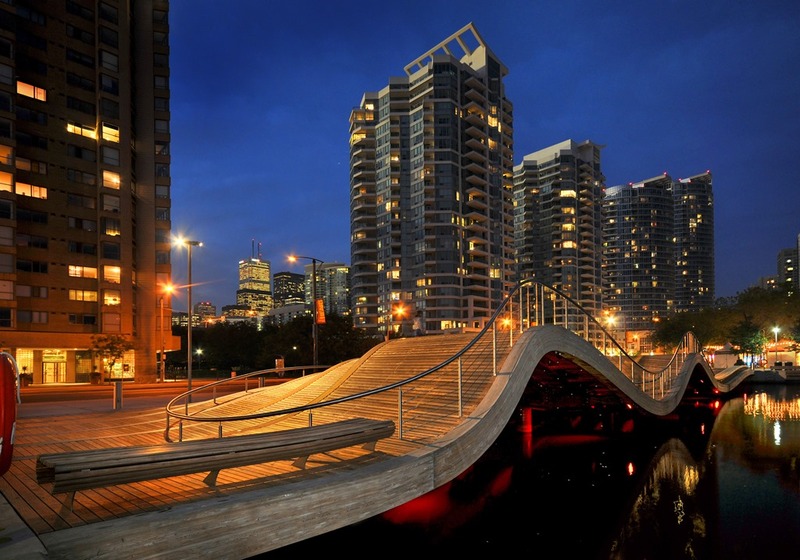 Toronto’s waterfront has a lot of photo locations to offer those looking for a skyline view, or a view of the water. Regardless which way you choose to face, the lakefront breeze, and lack of lighting obstructions means great shots here, if you come on a sunny day. Even the breeze off the water can help your shots by gently blowing your hair or a long dress. This area will have you surrounded by Victorian era stone industrial architecture. The cobblestoned path will make you feel like you are taking a trip through time, and the lack of invasive modern buildings means you can get some spectacular wide shots without including a glass condo. 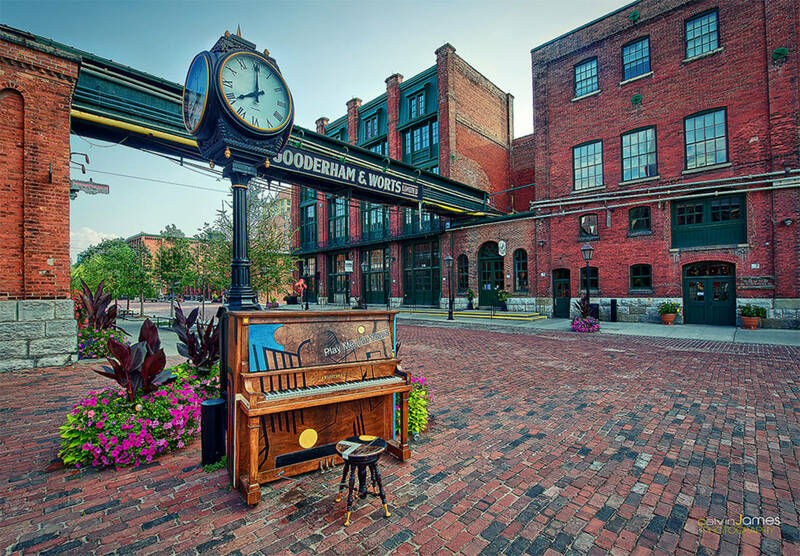 Whether you are looking for a brick wall as a backdrop, an old doorway for a frame within a frame, or a worn out stone path for a stylish shot of shoes, the distillery district has it all. Designed by cellist Yo Yo Ma, this garden is a very cozy, colourful, and maze-like spot on Toronto’s highly developed waterfront. Among the condos, you can find yourself in this secret garden, among butterflies, countless kinds of flowers, statues, and winding pathways. A very small but well-designed park, Toronto Music Garden is a place you can walk around in a few minutes, but with the variety of a much more vast place. 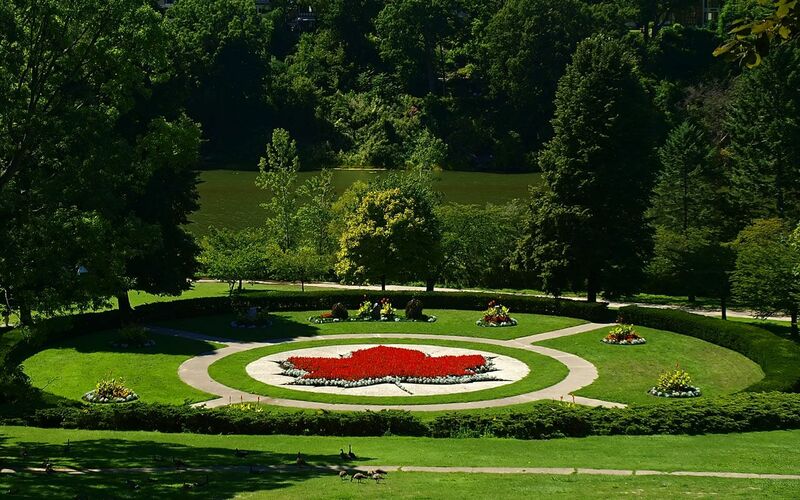 Toronto’s answer to central park, High Park offers many choices for photographic backdrops and visual inspiration. From the man-made gardens, ponds, bridges, and fountains, to the forest of old oaks, photos taken in high park can look like they are from a wide variety of locations. Grenadier pond offers a cottage country feel, combined with an urban look, with the Humber Bay condos on the horizon nearby. 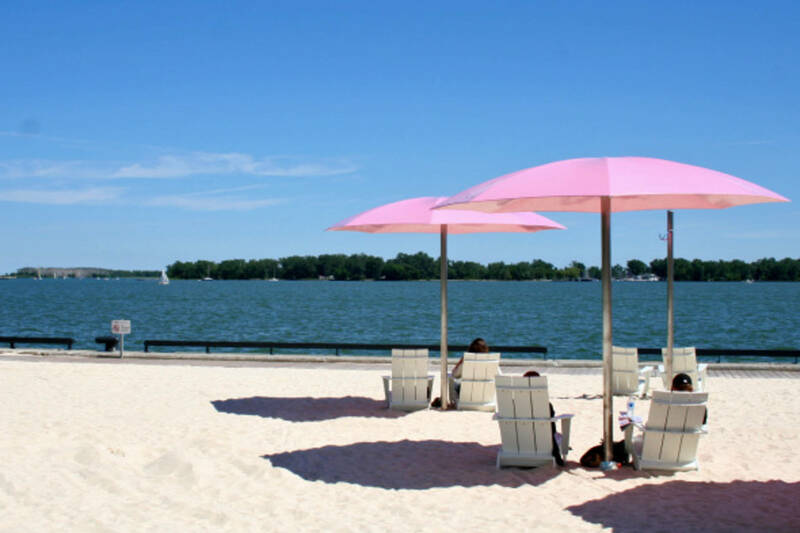 A newly-created urban beach next door to the Redpath Sugar Refinery, Sugar Beach is a cozy pocket of sand in downtown Toronto, just east from the core. Willow trees and colourful umbrellas dot the landscape on this elevated beach, where you can’t dip your toes into the water but can get shots combining a beach vacation and a day out in the city. Downtown Toronto’s only farm, Riverdale is a combination of historical heritage and character and nature that symbolizes Toronto. The farm itself is surrounded by thee park of the same name, that stretches over both sides of the Don River. 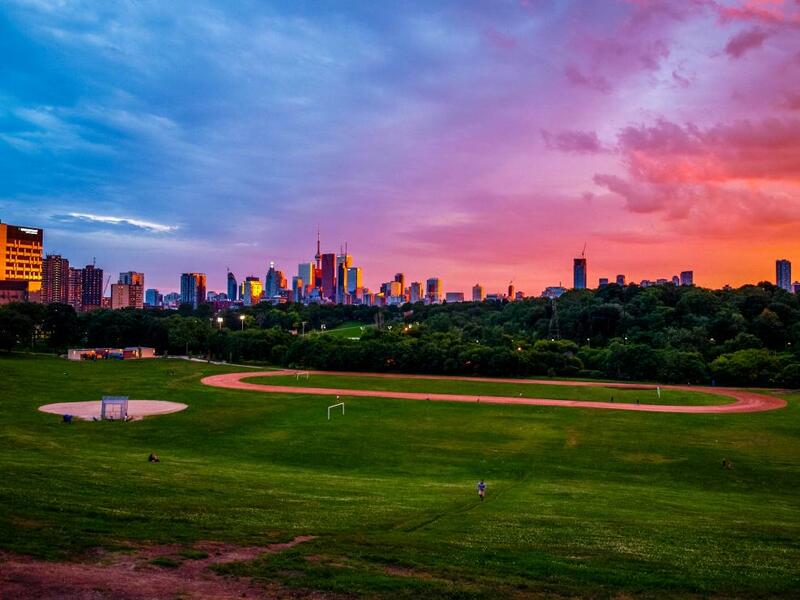 The park’s steep slopes offer stunning views of the city, particularly around sunset as it faces West. Here, your engagement shoot can have a rural touch, while being in the city. 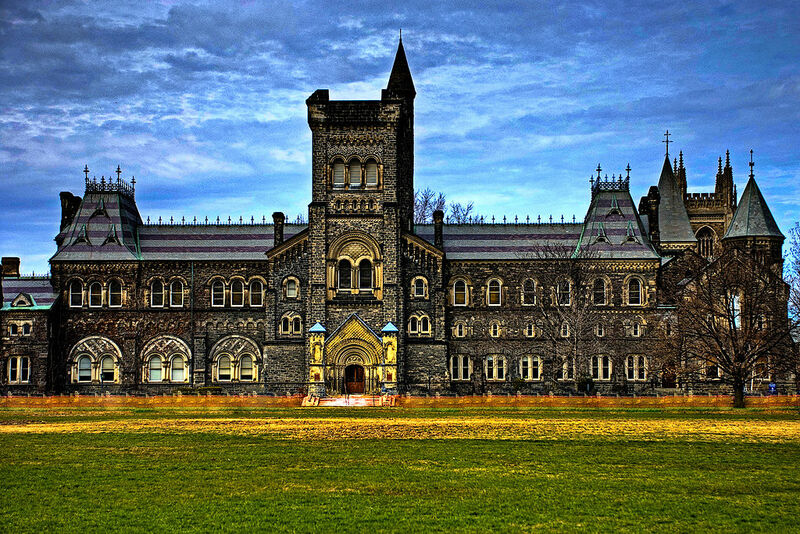 The University of Toronto is like a city in itself, a well-preserved and vast Victorian landscape untouched by modern development. Stage your very own vintage photo shoot under one of the stone archways or in front of an old wooden door. Your engagement can take a renaissance twist here. 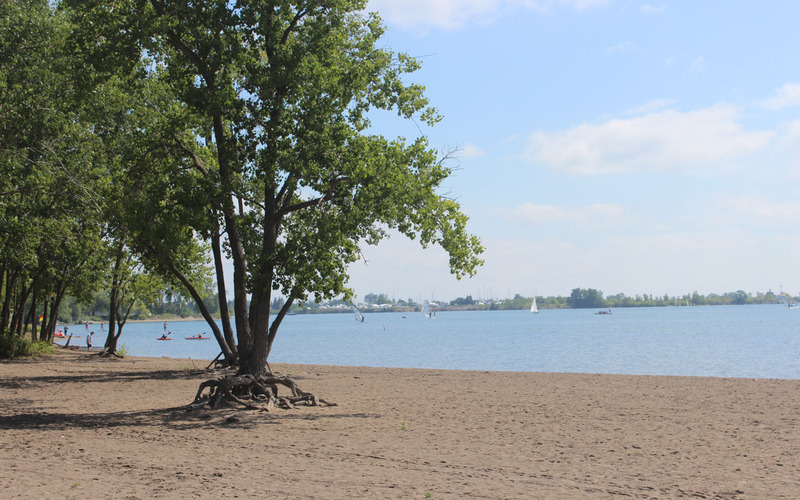 A more quiet and at the same time more central alternative to Woodbine or Sunnyside, Cherry Beach offers a natural beach environment surrounded by old trees, that you wouldn’t think is a walk away from the Gardiner. 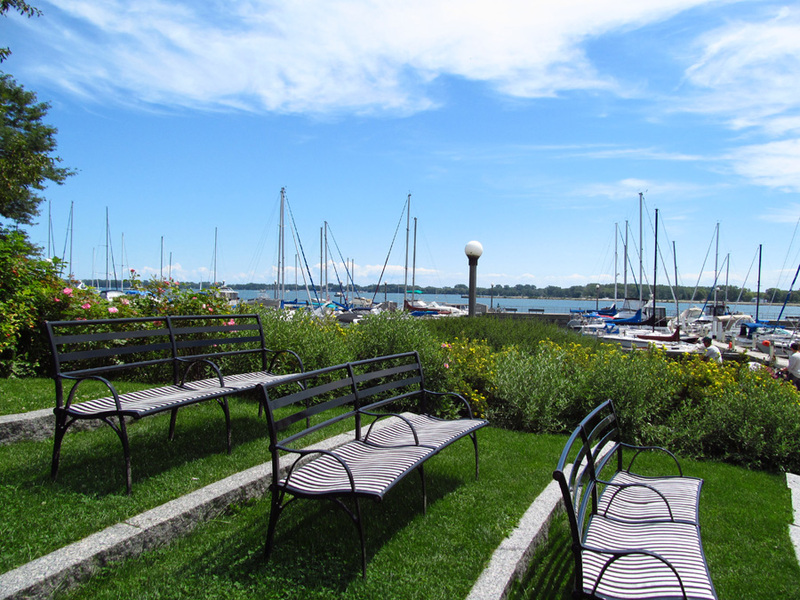 If you prefer secluded and quiet to the urban feel of Sugar Beach, this option is just minutes away. This utilitarian building resembles a palace on the hillside, in Toronto’s Beaches neighbourhood. Usually empty except for a few locals walking dogs, this spot combines historical architecture and wide landscape possibilities, along with a hill for endless perspectives. 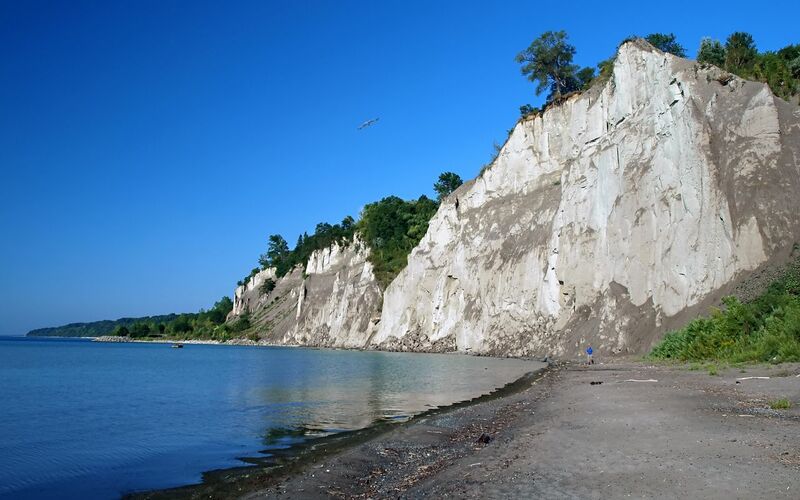 A classic options, the Scarborough Bluffs offer great perspectives and a long beach that is never as busy as the ones in downtown Toronto. If you are in for a challenge, attempt the climb at least halfway, with your loved one, for some adventurous engagement shots. What should I know about engagement photoshoot?